I know that after her 8th war patrol in WWII that her conning tower was replaced. What I didn't know was that the original conning tower apparently made it to Muskegon, Michigan at the Great Lakes Naval Memorial and Museum where the USS Silversides is located. The Silversides, at Muskegon's Great Lakes Naval Memorial and Museum, is a great way to spend an afternoon. In addition to the Silversides, they've got the Coast Guard cutter USCGC McClane (W 146) and the original conning tower from the Gato-class submarine USS Drum (SS 228) which had to be replaced after the Drum suffered severe damage from a Japanese depth-charge attack. Tom, did you know about this? Re: Location of the Drum's original conning tower? I believe that is a mock up of a sail that used be at Batleship park. So it's not the actual conning tower from the Drum then? No I believe its a mock up. compare the size of the kids to the sail, it looks too small. I found a photo yesterday or the day before that showed a sail on display at the park years ago before the pavillion was built and it was in the photo. At least they did something good with it instead of throwing it away like they did with a lot of other things. 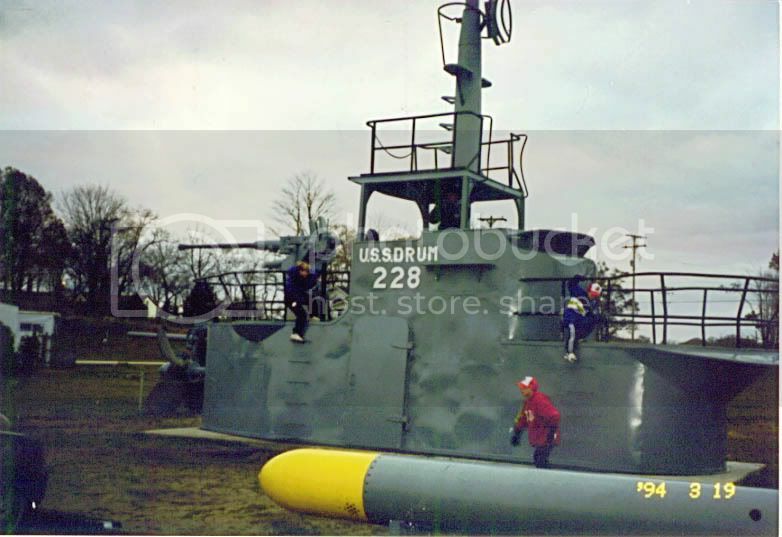 The mock-up of the tower left Battleship Memorial park around 1997-1998 to go to the Silversides park. Odd.